I was on my way to the West of West Wine Festival Grand Tasting in Occidental on an early August Sunday, and I had noticed that Scherrer Winery was holding their summer open house that same weekend. Since a detour to the winery outside of Graton would only take me a mile or two out of the way on my route to Occidental, it was an easy decision to stop by. The winery is located on along a small, unpaved drive that’s easy to miss if you don’t know where it is. Housed in a simple metal shed structure that was originally used for packing apples, the winery building is as low-key as Fred Scherrer and his wines. I managed to arrive while things weren’t too busy – it got considerably more crowded by the time I left – so I had an opportunity to chat for awhile with Fred and his father Ed. Scherrer 2010 Chardonnay, Helfer Vineyard, Russian River Valley. Medium straw color, featuring apple and nectarine, lees, spice, and a touch of minerals along with a bit of vanilla/oak. Medium-bodied with a creamy mouthfeel and a long, lively finish. It’s tasty now, but I think the components still need time to integrate more, and experience has shown that the Helfer Chardonnays gain a lot from bottle age – older vintages almost always show exceptionally well. Scherrer 2008 Pinot Noir, Platt Vineyard, Sonoma Coast. Platt Vineyard is located at about 600-foot elevation outside the cool, coastal town of Bodega. Medium ruby color, with very aromatic black cherry and plum fruit, floral notes, and lots of spice. Medium weight in the mouth, this finished with moderate tannins. Enjoyable for its aromatics right now but should age and gain complexity with time. Scherrer 2009 Pinot Noir, Platt Vineyard, Sonoma Coast. Slightly darker color than the 2008 bottling, this had a more complex nose of black cherry, earth and mushroom, spice, and minerals. Richer and with a more layered and textured feel on the palate, the finish showed more grip than the 2008. This is a serious Sonoma Coast Pinot that is deserving of some time in the cellar – it’s very distinctive now but could be tremendous given a few more years. Scherrer 2011 Zinfandel, “Shale Terrace,” Scherrer Vineyard, Alexander Valley (barrel sample). Medium-dark color, displaying intense raspberry and boysenberry fruit and spice aromas with a touch of the minerality that usually distinguishes this wine. Bright mouthfeel with great acidity, this had mild to medium tannins on the finish. A bit tough to judge at this stage but this seems quite promising, and I’d guess that the minerality and other complexities of the wine will come out with more time – right now the youthful upfront fruit is dominant. Scherrer 2011 Zinfandel, “Old & Mature Vines,” Scherrer Vineyard, Alexander Valley (barrel sample). Darker color, the fruit aromatics were more shy than the “Shale Terrace” barrel sample, but showed darker berries plus more earth, spice, and pepper. Bigger and richer on the palate, this also had a firmer tannic finish. While the “Shale Terrace” may carry a more distinctive profile than most Zins, the “OMV” displays its “old-vine” Zin character very well. Scherrer 2007 Zinfandel, “Old & Mature Vines,” Scherrer Vineyard, Alexander Valley. Medium-dark purple color, this showed bright wild berry and plum fruit, dried herbs, pepper, and earth on the nose. Medium-full bodied with a mouth-coating texture, this had a bright finish with the peppery component of the wine returning along with moderate tannins. The “OMV” Zins have tended to age well and I’d expect this one to follow suit. Scherrer 2008 Syrah, Russian River Valley. Sourced from Timbervine and Calypso vineyards. Dark color, with dark berries, flowers, earth, black pepper, and a meaty, savory note. The lively acidity balanced a fairly rich mouthfeel, finishing with a medium-big tannic bite. Showing its cooler-climate vineyard origins well, this is a very pretty young Syrah that should develop nicely in bottle. 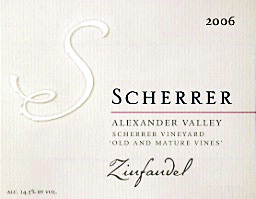 Scherrer 2006 Cabernet Sauvignon, Alexander Valley. Dark color, with a nice purity of cassis and plum fruit, along with herbs, minerals, and spice. Medium-bodied and well-structured, the big, grippy finish suggests that more cellar time will be beneficial for this wine. Far from the style of Cab that pushes the envelope with ripeness and oak, this is more in the mold of fine California Cabs from the past. 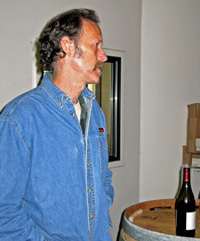 Fred founded Scherrer Winery in 1991, while he was still working at Dehlinger Winery. Ed owns Scherrer Vineyard in Alexander Valley, with Zinfandel first planted there by Ed’s father in 1912. Fred studied enology at UC Davis, and worked at Fieldstone and Greenwood Ridge wineries before settling in for over a decade at Dehlinger, where he worked his way up to becoming the winemaker there. He left Dehlinger in 1998 to focus on his own label. Fred’s wife Judi handles of the business side of the winery. 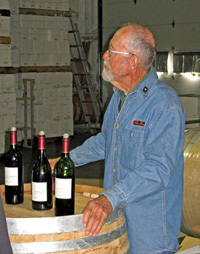 Fred produces several different bottlings of most of the wines he makes – Chardonnay, Dry Rosé, Pinot Noir, Zinfandel, Syrah, and Cabernet Sauvignon. As usual, both Fred and Ed poured wine at the open house. Fred poured a Chardonnay and two Pinots, and pulled barrel samples of two 2011 Zinfandel futures offerings, while Ed took care of an older Zin, plus Syrah and Cabernet. In keeping with everything about the winery, the tasting arrangement was nothing fancy – the bottles were set up on top of upright barrels in the utilitarian winery space, with five-gallon plastic buckets on the floor for spit/dump buckets. As always at the Scherrer open house, there were some delicious appetizers in addition to all the wines. The Scherrer summer wine offering and open house feature the popular futures offering of two of the winery’s most sought-after wines, the “Shale Terrace” Zin and “Old & Mature Vines” (or “OMV”) Zin. Both of these wines from the 2011 vintage had just been blended and returned to barrel shortly before the open house, and will be bottled in March 2013 and released the following month. Although the “Shale Terrace” bottling had already sold out – the “OMV” bottling is still available – Fred pulled barrel samples of both wines for tasting at the open house. Of special note is that 2012 marks 100 years since the “Old & Mature” Zinfandel vines were planted at Scherrer Vineyard. The Scherrer wines all show great balance and structure, and they have a track record of aging very well so I try to hide most of them away for at least a few years before opening them. Other than the open house events (April, August, and November), the winery is open to visitors by appointment only – though not during the busy fall crush season. Fred Scherrer and his wines have never followed the latest trends – they don’t attempt to push the edge of ripeness, either high or low – so they seldom get the kind of attention that some other winemakers and wineries do. But Scherrer continues to produce some of the most consistent wines you’ll find from Sonoma County – well worth checking out.